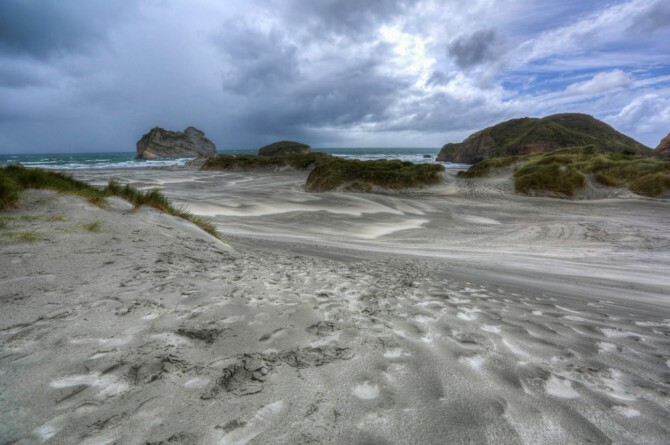 With over 15,000km of coastline, New Zealand has a plethora of beaches to choose from. We had the chance to explore a lot of New Zealand’s coastline and along the way discovered some incredible beaches that are not only beautiful but offer some fun and adventure along the way. Whether it’s sandboarding, surfing, blokarting, swimming with dolphins – there are heaps more to do than just lay on the beach! 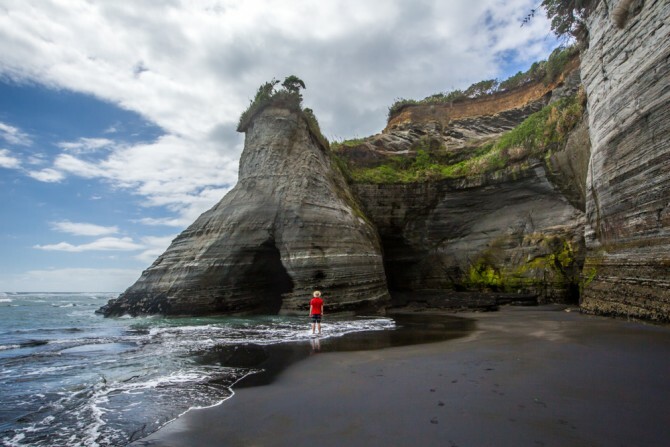 Beaches like Piha, 90 mile beach and Hot Water Beach in The Coromadel usually get the spotlight in many Top 10 New Zealand beach lists, but we wanted to share a few more lesser known beaches that are just as stunning and offer something unique for the adventurer out there. 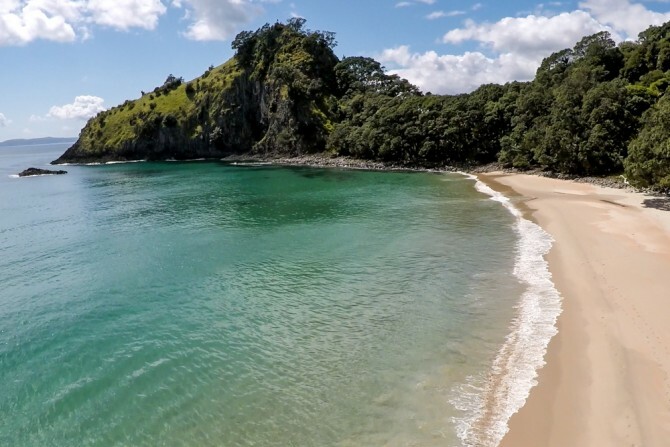 New Chums Beach is one of the last undeveloped beaches in the Coromandel and has been voted one the top deserted beaches in the world! The kilometer long stunning white sand beach is surrounded by untouched native Pohutukawa and native forest and is deserted for many parts of the year. 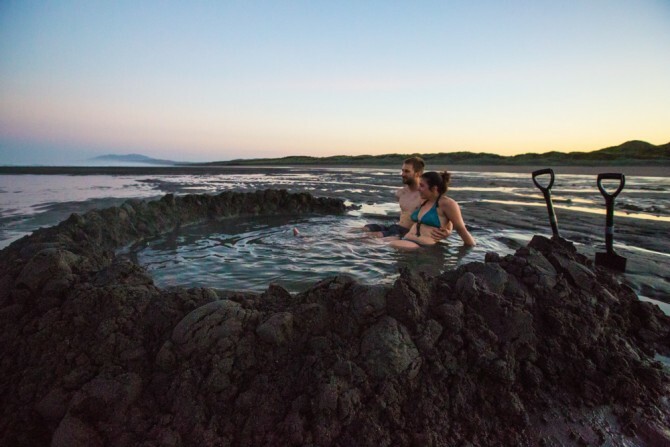 Accessible at low tide by wading through a estuary followed by a 20 minute hike through the bush means you can enjoy its beauty without the crowds. 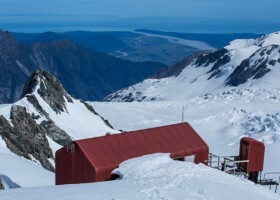 Be sure to take the detour up Motuto Point for a steep scramble to the top for some incredible views! EVERYONE who’s been to New Zealand has likely had a stop at The Coromandel’s famous Hot Water Beach. No question that is a cool spot, but the crowds that usually accompany it means its no longer a secret. 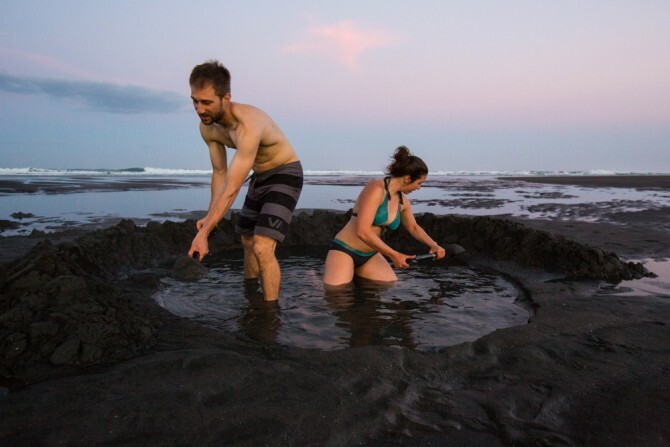 The lesser know hot water beach in New Zealand is located at the end of Ocean Beach Road in Kawhia just south of Raglan. It’s so secret we were literally the ONLY people there and to find it requires a bit of local knowledge. After parking at the end of the road, climb up over the sand dunes. You’ll see a large piece of driftwood stuck in the sand as a marker of where to go. Literally walk directly towards the ocean from that stick and feel with your toes for warmth in the sand flats and follow your nose for the smell of sulfur. We had a bit of a harder time because it was still dark, but once we found it – WOW! The perfect temperature for your own personal hot tub. Just be sure to get there about 2hrs BEFORE low tide to maximize your time! We stumbled upon this gem during our first few months in New Zealand and it still ranks as one of our favorite beaches in the country. 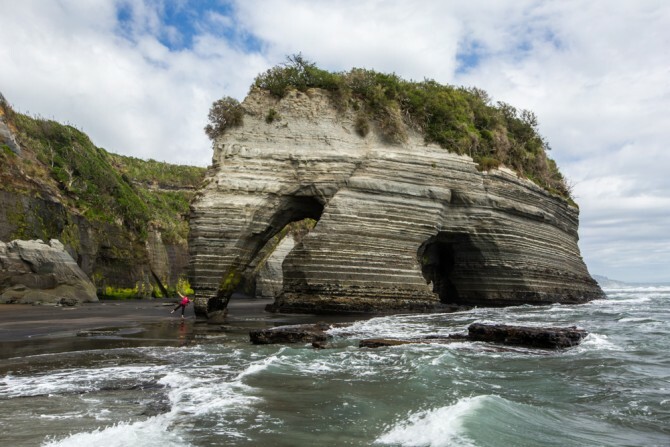 Located about an hour outside New Plymouth in Tongaporutu, The Three Sisters Beach is a beautiful black sand beach accessible at low tide where you can explore several sea caves, towering colorful cliffs and some unique rock formations. The coolest feature of this beach though is the giant, mammoth shaped rock that looks like something from a prehistoric era! 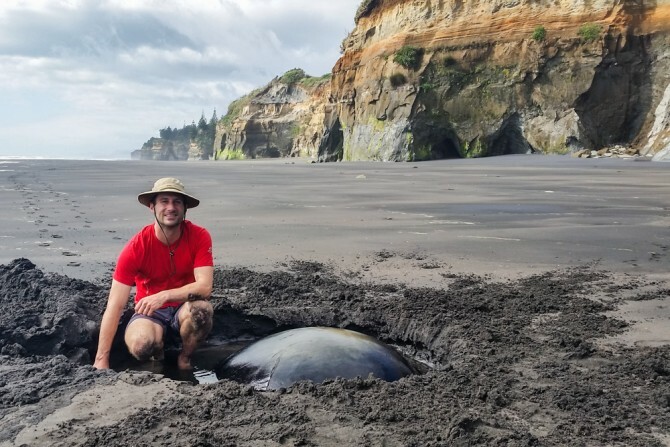 The latest feature we discovered at this beach while on our surf roadtrip with YHA was a series of buried spherical boulders (similar to Moeraki or Koutu boulders) which are featured on the cover the NZ Frenzy (BEST NZ guide book). To see them though you have to dig! Try to find them yourself (HINT: Go right across the stream instead of heading towards the Elephant rock). 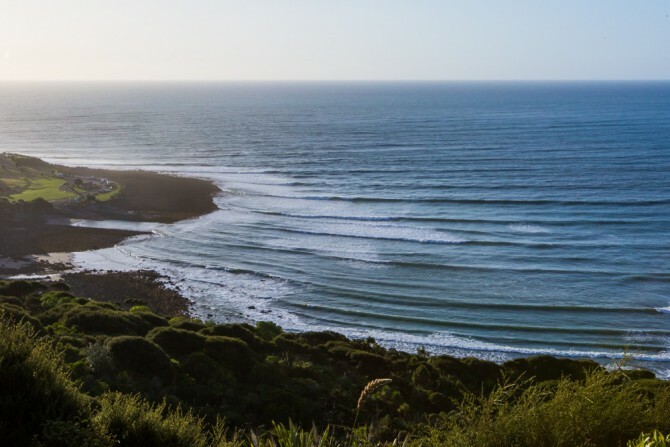 Raglan is probably the most famous surf town in New Zealand. It’s beach and reef breaks offer consistent, perfect waves for surfers of all levels to enjoy. 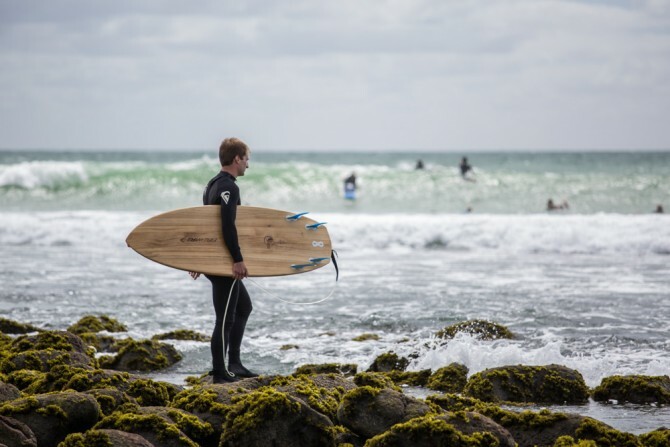 While on our last roadtrip in New Zealand we spent 4 days in Raglan surfing and while many tourist flock to Ngarunui Beach for the beach break and rental boards, the locals surf at Manu Bay. Located just down the road from Ngarunui Beach, this reef break is easily accessible from the carpark, offers a great spot for viewing and has some of the best waves in the country. The entrance can be a bit tricky and the size of the waves intense so I wouldn’t recommend it for beginners but if you’re an experienced or intermediate surfer (or just want to watch some!) Manu Bay is the perfect spot. Castlepoint Beach has a special place in my heart. Not only is it where Jordan proposed but there are just so many little adventures to be had! 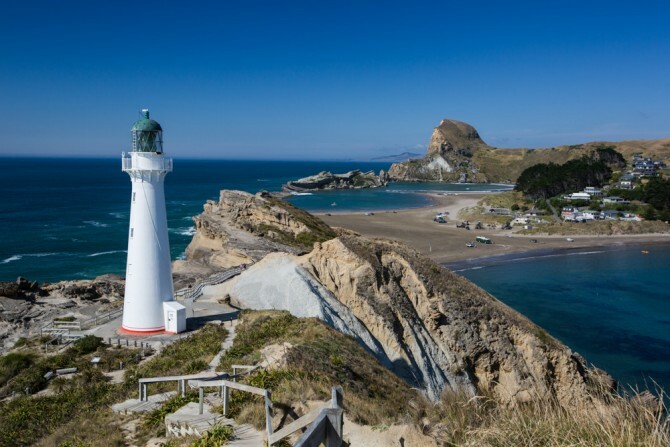 A couple hours drive from Wellington on the Wairarapa coast, Castlepoint feels like a world away from the city. Explore the iconic lighthouse, hike to the top of Castle Rock for some incredible views and go on an adventure at low tide underneath the lighthouse to the sea cave guarded by a giant seal! If he’s home, I wouldn’t advise going further, but if not, be sure not to miss this huge cathedral cave! 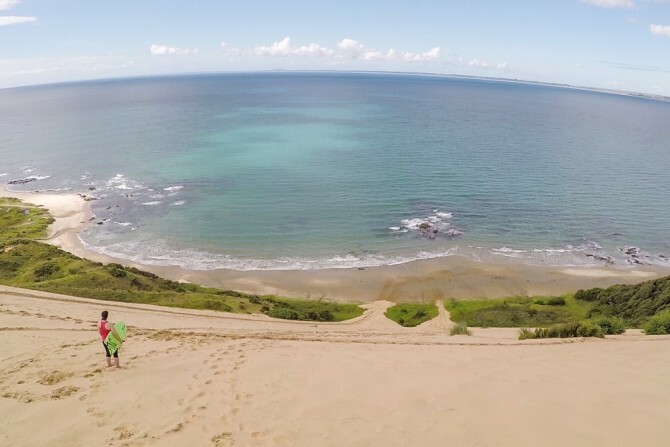 Located at the start of the famous 90 mile beach, Ahipara is a quiet town in Northland that offers some awesome beach adventures! 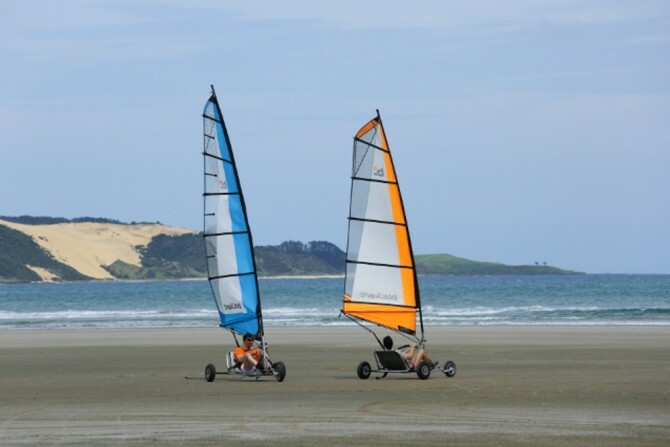 Whether its blokarts on the beach or racing down New Zealand’s steepest sand dune, stop in to see Robin at Ahipara Adventures and she will get you sorted! 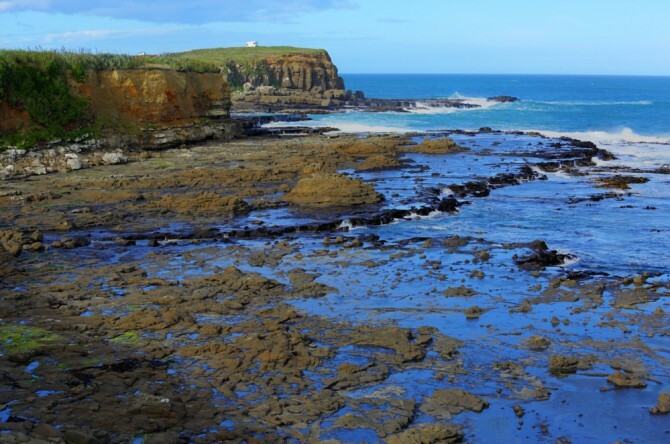 Heading all the way to the bottom of the South Island, Curio Bay is one of New Zealand’s best kept secrets. 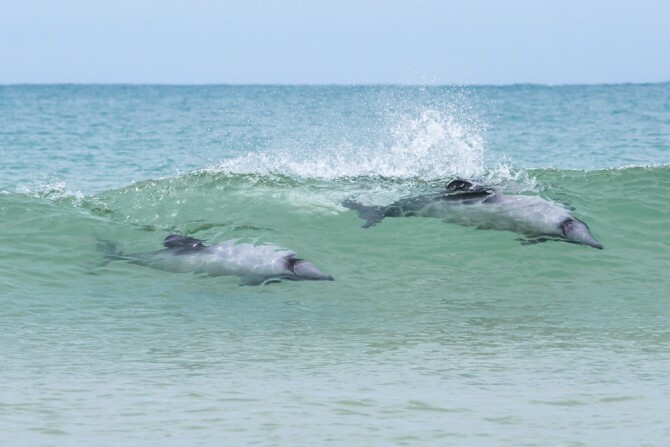 Home to a pod of Hector Dolphins, you can rent a surfboard on the beach and literally SURF WITH DOLPHINS! These playful little guys love to play in the surf and are happy to swim amongst the surfboards. 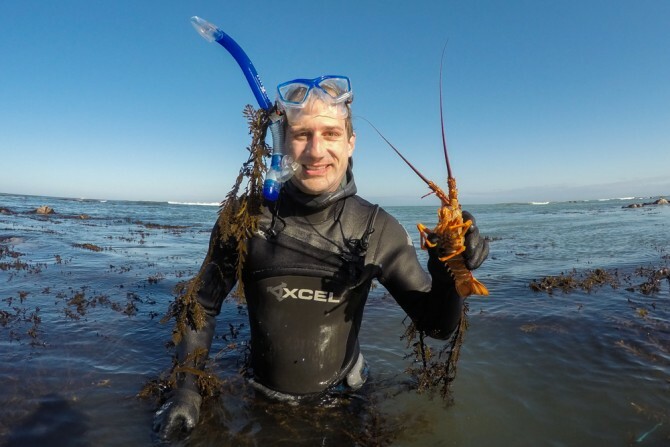 A truly unique experience if you’re in Southland don’t miss out on visiting this beach! Another added bonus is there is a petrified forest home to some resident yellow-eyed penguins. Head down there at dusk and observe (from a safe distance) these cool little creatures! 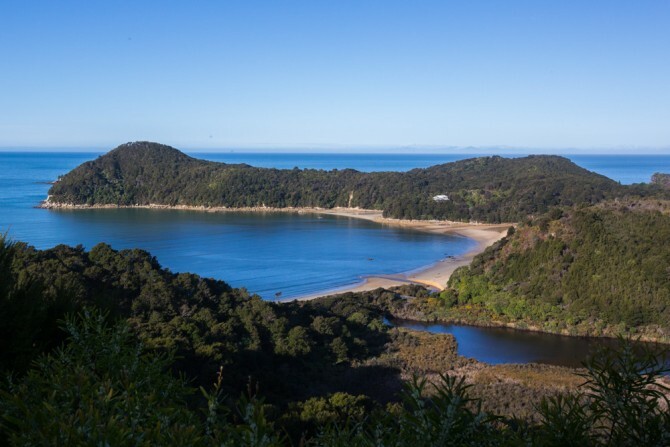 Accessible by water taxi or a 4hour hike, Anchorage Bay is located in the stunning Abel Tasman National Park. This semi-circular bay is a hub for a number of activities in the park and a stop along one of New Zealand’s famous Great Walks. 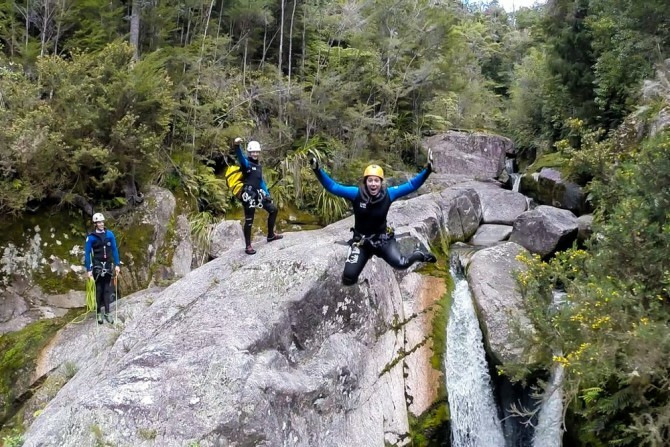 If you’re up for some real adventure, this is the beginning of the Torrent Bay Canyoning adventure with Abel Tasman Canyons. An action packed day of abseiling, cliff jumping and rock slides, this is one adventure not to be missed! The day finishes up at Cleopatra’s Pool which is a natural, moss-lined waterslide (also accessible by walking 1 hour from Anchorage Bay). If you’re looking for a more chilled out day, kayak through the inlets and secluded beaches with Abel Tasman Kayaks! Sitting at the northern tip of the South Island, Wharaiki Beach was one of the most dramatic beaches we experienced. A short 30min walk through sheep fields brings you to the remote beach known for big waves, big dunes and ferocious winds. 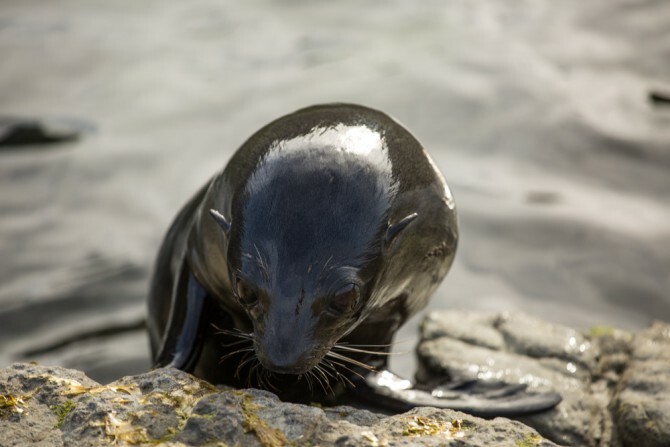 Be sure to come at low tide to explore the sea caves and access the small islands filled with BABY SEALS!! If you’re really up for the challenge, you can walk to Farewell Spit in about 3-4hrs to the narrow sand pit. 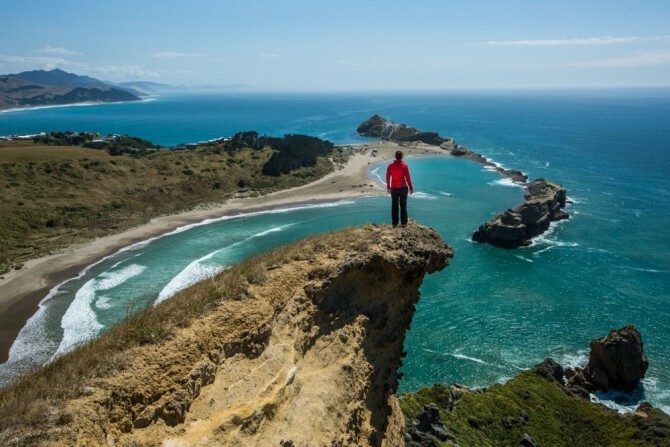 Did we miss any New Zealand beaches that are great for adventure? Share in the comments! Good info and beautiful images. Looks like had good time. Thank you for sharing.